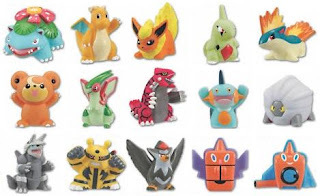 Bandai will release the following 15 figures of Pokemon Kids National Dex series 2 in the end of January. This series has been just started after completion DP series. Photo of Rotom, Cresselia figures in Tomy Moster Collection series is uploading to the previous article, will be released on 27 December. 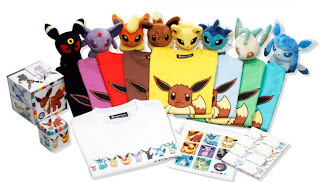 PokemonJP announces that Eevee goodies collection will be availabe at all Pokemon Centers in Japan from 6 December, includes Pokedoll, foods, stationery and T-Shirts. 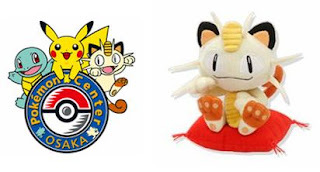 PokemonCenter Oosaka will mark 10th anniversary on 14 November 2008. They are going to be held Meowth Festa. (Meowth is included as Oosaka logo) The following plush and others will be available at Oosaka only. BTW, this Meowth posing has meaning. It is based on 'Maneki Neko' ： A Happy-Come-Come-Cat/Welcome Cat. We believe to bring good luck to the shop owner. Generally we decorate it at entrance. Please read more detailed in wikipedia. McDonald'sJP releases the following 2009 Pokemon calendar on 6 November. As for other 2009 calendars, please refer to Pokemon 2009 Calendar (Étoile) and Pokemon 2009 Calendar 2 (PokemonJP). Tomy will release the following figures in December 2008 on 26 December 2008 additionally. As for Cresselia, it has been released in figures box set. PokemonCenterJP distributes the following ad paper, named 'Eevee Collection'. At the moment unknown detailed... Why no Glaceon ?? Will edit this later. If interesting in Eevee evolution figures collection, please refer to TomyMC Eevee evolution figures set. The following Leafeon Glaceon Plush from Tomy are postponed to 11 December unfortunately. Subarudo will release 10 figures, Chupa Suprise Figure DP5 'Let's Battle !' in the end of November. Canday toys, size is 0.9", a figure is inside one of 5 kinds Poke Balls (PokeBall, SuperBall, Hyperball, NetBall, NestBall) . If want know previous items, please refer to Pokemon Chupa Surprise Figure DP4. Including blocks of New Pokemon DX Bucket DP(release on 25 October) and Pokemon Block Land DX (release on 8 November) are corrected in previous article. Also please visit to Bandai Megablocks official pages, we can see detailed info. Thank you for waiting and many messages about worry. I have backed from 'network isolation' place. Will run again about Pokemon toys news slowly and steadily. Hoping you will enjoy AAPF again.